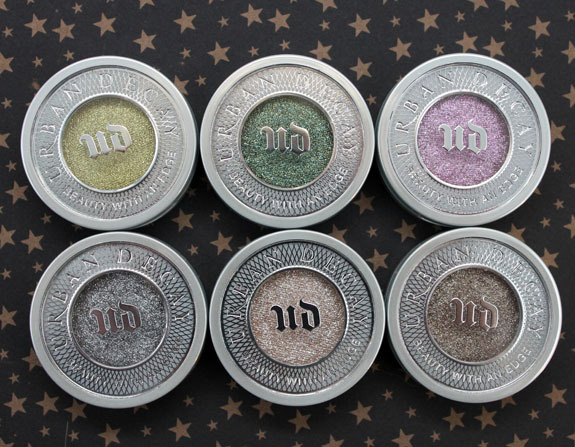 Urban Decay Moondust Eyeshadow is a new glittery eyeshadow that comes in seven shades. 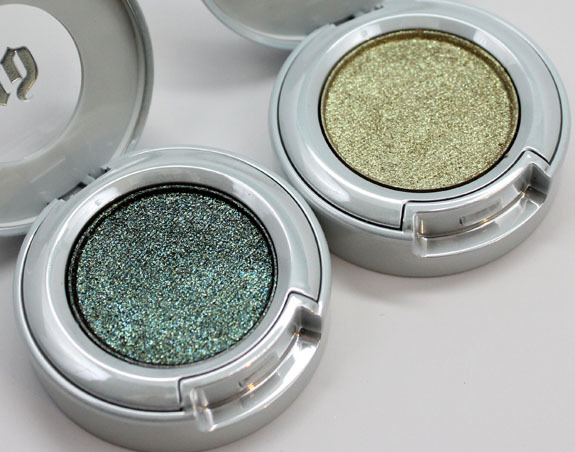 These eyeshadows feature microfine iridescent sparkles, rather than chunky glitter pieces. They are meant to be more “adult” with a diamond-like effect. They feel pretty smooth, more like a cream shadow, but they are a pressed powder. 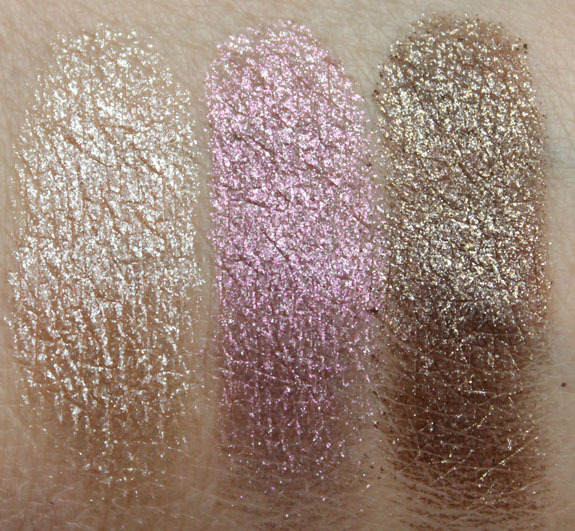 They apply like a powder and have tons of depth, sparkle and some with a 3-D-like effect. No grit whatsoever! 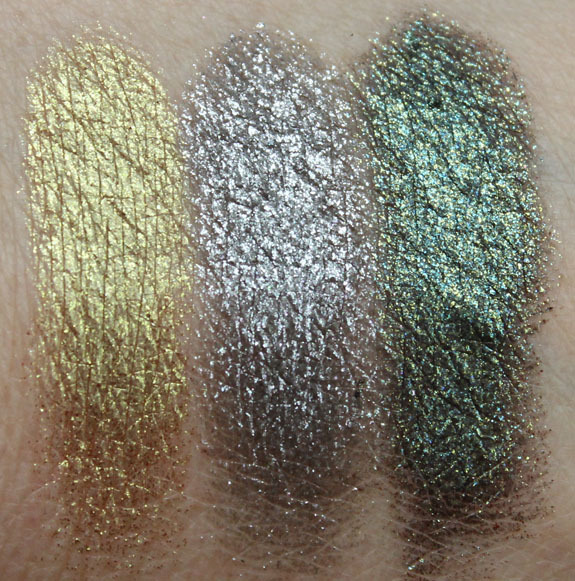 As far as fallout…well I haven’t worn them on my eyes yet, but I can say they definitely get fine sparkles everywhere when swatching on my hand! They suggest applying with a finger (which is what I would do since that helps with fallout) and you can use wet or dry. They come in the “pop-out” silver compacts, that you can put into their Build Your Own Palette system also, which is great! Space Cowboy is a champagne with silver sparkle. Glitter Rock is a metallic pink with pink 3-D sparkle. Stargazer is a lime green/gold with gold 3-D sparkle. AMAZING, my 2nd favorite one here. Moonspoon is a medium grey with silver sparkle. 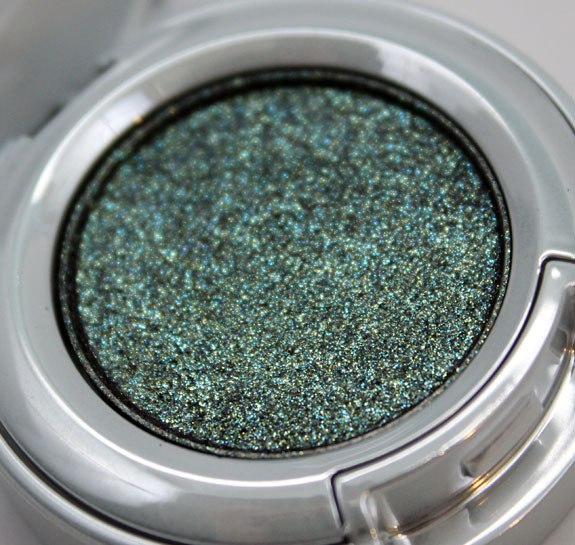 Zodiac is a smoked out black with heavy blue/green shift and blue/green 3-D sparkle. This, of course, is my favorite one. I could stare at it all day. The one I don’t have is called Intergalactic and it’s a medium purple with silver sparkle. 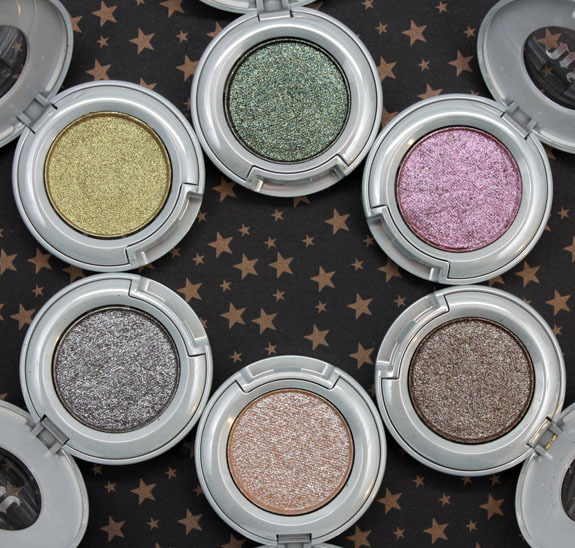 Overall: These are really quite cool if you like sparkly shadows. 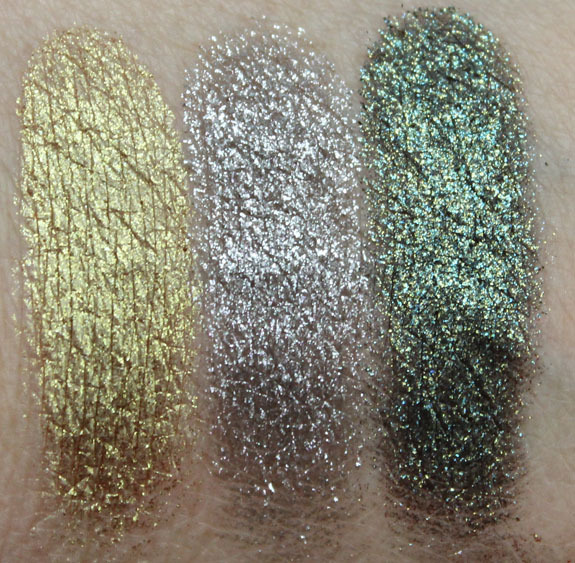 They don’t have a gritty or harsh feel to them, and they are really quite pigmented. I have a sneaky suspicion they won’t exactly be mess-free when applying them, especially dry, but maybe worth it! I think the deeper shades are the more interesting ones. 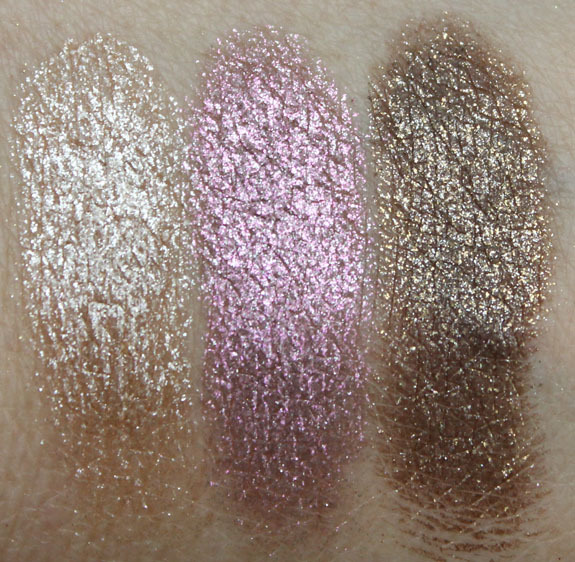 I love Stargazer and Zodiac especially because they are really interesting and intense shades. Availability: Sephora, Ulta, Urban Decay (soon). What do you think about these? Sparkly enough for ya or too sparkly? Disclosure: The product(s) in this post were provided to me by the manufacturer or their PR company for consideration. For more information please visit my legal page. Vampy Varnish is dedicated to showing high resolution makeup and nail polish swatches, and providing honest product reviews. My name is Kelly and I'm an SF/Bay Area native and proud owner of 3 cats and a dog. Vampy Varnish started in 2008 as one of the very first nail blogs. It then morphed into a nail polish and makeup blog. Now it captures all sorts of things that interest me including pets, books, clothes, home items and more! @2008-2018 VampyVarnish. All Rights Reserved.